This week’s highlighted shirt is our Pop Art Spoonbill Pattern, shown on a light blue t-shirt. This is a cute, unique repeating Spoonbill silhouette pattern. When we lived in Holland, we used to like looking for Common Spoonbill who would summer there. This design was based on our white Spoonbill, but the silhouette is similar to (southern) North America’s familiar Roseate Spoonbill. 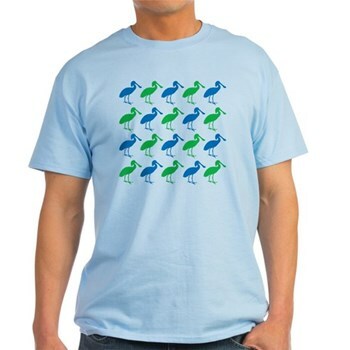 This Spoonbill T-Shirt is great for birders and budding birdwatchers. Who doesn’t love spoonbills, the graceful wading bird with the utensil-shaped beak? This week’s highlighted shirt is our FBI Spoof Fanatic Birding Individual, shown on a dark t-shirt. Only a select few can join the FBI. The most serious birders are Fanatic Birding Individuals. This funny, unique FBI spoof design makes a great gift for bird lovers and birdwatchers of all levels. This week I’d like to highlight a t-shirt designed for bird banders or bird ringers: I’m With the Banders. This design spoofs the phrase I’m with the Band. This t-shirt for bird banders reads I’m with the Banders. The accompanying image is a set of needle nose pliers, one of the tools of the bird banding trade. Bird banding is a great aid to the study of birds. This is a cute gift idea for anyone that bands wild birds.